Is The Florida Bar A Racist Organization? Do They Discriminate Against Their Black Members? Do They Discriminate Against Black Clients Who File Complaints Against White Lawyers? Is There A Certain “Classification” of Lawyers Who Are Immune From Disciplinary Actions Being Brought Against Them? Or Is The Florida Bar Just An Extension of Tallahassee’s ‘Good Ol’ Boy’ Network? Tallahassee, FL—According to floridabar.org, The Florida Bar is located in Tallahassee, Florida (Leon County). The Florida Bar is an organization of all lawyers who are licensed by the Supreme Court of Florida to practice law in the state. In lawyer desiring to practice law in Florida must be a member of the Florida Bar. Although The Florida Bar has many responsibilities, its core functions are to prosecute unethical lawyers through the Attorney Discipline System, as well as administer a client protection fund to cover certain financial losses a client might suffer due to misappropriation by a lawyer. According to a formal complaint document leading to Mr. Hobbs Disciplinary Actions, the Florida Bar forwarded an inquiry/complaint to Mr. Hobbs on September 12, 2012. This inquiry/complaint came about by way of Keith Biggins who’d hired Mr. Hobbs on January 4, 2011 to represent him “in Federal Court, to file a motion for a new trial and to interview people for new evidence and possible jury tampering.” The defendant (Keith Biggins) paid $5000 toward a $10,000 total fee. In July 2012 Carissa Chambers (Black female)(DeShon Thomas’ mother) filed an inquiry/complaint along with supporting documents with The Florida Bar against longtime Tallahassee Attorney Gregory Cummings (White male) after she’d paid Mr. Cummings $29,850 of a $50,000 total fee. Mr. Cummings, who aggressively solicited Ms. Chambers into hiring him, had not done anything in accordance to what he’d promised he would do in order to build a legal defense for DeShon Thomas. DeShon Thomas, who is Black, was a 17-year-old freshman at Tallahassee Community College and part-time employee at Taco Bell when he was charged with the January 27, 2011 double murder of his 20-year-old pregnant ex-girlfriend (Laqecia Herring) and her 17-year-old brother (Sterling Conner Jr.). The victims were found in their mother’s southeast Tallahassee townhome in Leon County. Ms. Herring’s toddler daughter was also in the home—she was unharmed. While DeShon Thomas had been appointed a Public Defender, a few days after DeShon had been charged with the murders, the Office of the Public Defender called DeShon’s mother to inform her that they would no longer be representing DeShon due to a conflict of interest. The Office of the Public Defender informed DeShon’s mother that DeShon will be represented by the Office of Criminal Conflict and Civil Regional Counsel. After providing DeShon’s mother with the phone number to the Office of Criminal Conflict and Civil Regional Counsel, DeShon’s mother was informed that she could also keep in contact with the Leon County Clerk of Courts for updates on DeShon’s case. For nearly a month DeShon sat in the Leon County Jail without an attorney or having gone before a judge. Meanwhile, DeShon and DeShon’s mother was constantly calling the Office of Criminal Conflict and Civil Regional Counsel’s Office as well as the Leon County Clerk of Courts seeking to learn the name of DeShon’s Regional Counsel. Each and every phone call yielded the same answer, “No one has been assigned to DeShon’s case.” Hoping to get a name—DeShon’s mother also went down to the Leon County Clerk of Courts two sometime three times a week seeking the name of DeShon’s court appointed attorney—to no avail. It was also during this time when DeShon’s mother was introduced to Mr. Cummings. DeShon’s mother told Mr. Cummings that she’d already spoken with attorneys Tor Friedman and Alex Morris but was not going to hire an attorney without speaking with DeShon’s court appointed attorney first. Mr. Cummings was quick to discredit two attorneys—stating that they were incapable of providing an adequate defense for DeShon. DeShon’s mother was not inclined to hire Mr. Cummings. Little did DeShon’s mother know that she and DeShon were on a racist freight train traveling full speed ahead from the Leon County Sheriff’s Office into the Leon County Courthouse—with all ‘Tallahassee Good Ol’ Boys’ on board. While Mr. Cummings would not leave DeShon’s mother alone—going as far as to calling her on March 10, 2011 the day after DeShon was Indicted for the double murders and telling her that Circuit Judge James C. Hankinson was incompetent for not having assigned DeShon Regional Counsel—stating, “Clearly the judge does not have your son’s best interest at hand.” It was during that phone call when DeShon’s mother—who was under duress—had agreed to hire Mr. Cummings. DeShon had been in the Leon County Jail for over a month without speaking with anyone—no attorney—no judge. DeShon was 17-years-old and had not committed the murders—DeShon is Innocent! DeShon depended on Judge James C. Hankinson to assign him legal representation in a timely manner. When Judge James C. Hankinson failed to do so, DeShon depended on his mother’s limited finances and whatever her capability to get him a private competent defense attorney—her decision also failed. But her decision to hire Mr. Cummings also exposed a working injustice system within Leon County Courtrooms. In which Mr. Cummings would be fired by DeShon and his mother for his participation—unethical practice. In addition, Mr. Cummings continued to solicit DeShon’s mother despite Mr. Cummings knowledge of DeShon having been assigned a court appointed attorney. Mr. Cummings never disclosed the information regarding the court appointed attorney to neither DeShon nor DeShon’s mother. DeShon and DeShon’s mother signed a Contract for Service on March 12, 2011. Over the next sixteen months, Mr. Cummings would only see DeShon 3 times—never building a legal defense for DeShon or developing a client/ attorney relationship with DeShon—a severe lack of communication. It would take DeShon’s mother to learn that Circuit Judge James C. Hankinson had intentionally withheld the names of DeShon’s court appointed attorneys—and withheld Motions that he signed with the attorneys names on them from the Leon County Clerk of Courts. DeShon’s mother also learned that while State Prosecutor Jack Campbell filed several motions for continuance for trial—Mr. Cummings never objected—and all were granted. Mr. Cummings was aware that 2nd Circuit State Attorney Willie Meggs, Chief Assistant State Attorney Georgia Cappleman, Assistant State Attorney Eric Crombley, Leon County Sheriff Larry Campbell and his son State Prosecutor Jack Campbell had all lied in order to have DeShon charged with the murders—yet, Mr. Cummings did nothing to build a legal defense to protect DeShon. In response to DeShon’s mother’s July 2012 complaint, Mr. Cummings does not explain or deny aggressively soliciting her to hire him. Instead, Mr. Cummings sounds more like a member of the prosecuting team than the defense counsel. Mr. Cummings never filed any motions for hearings or a defense witness list. Mr. Cummings never took depositions of any law enforcement officers or of the one key witness to whom Leon County Sheriff Detective Don Odham claimed to have given incriminating statements against DeShon. (DeShon’s mother also learned that Don Odham was not a Leon County Sheriff’s Detective as all court documents and law enforcement reports list Don Odham as Detective Odham. Don Odham was a Reserve Deputy—who close friendship (not work experience) with Leon County Sheriff Larry Campbell and his son State Prosecutor Jack Campbell allowed him the privilege to perform duties outside the scope of a Reserve Deputy. Don Odham was allowed to process the crime scene and was assigned the Lead Detective on the double homicide case. Mr. Cummings was fully aware that 17-year-old DeShon Thomas’ Constitutional Rights were being trampled on—yet, Mr. Cummings stood by collecting DeShon’s mother’s money—while doing absolutely nothing to respect the laws set forth by the Florida Supreme Court. In December 2012 DeShon’s mother received a letter from The Florida Bar in response to her complaint—the letter stated that Mr. Cummings had not violated any of The Florida Bar Rules. In March 2013 DeShon filed a complaint with The Florida Bar against Mr. Cummings. Mr. Cummings had failed to disclose information that could’ve exonerated DeShon. DeShon had repeatedly asked Mr. Cummings to provide him with a copy of his (DeShon’s) AT&T cell phone records and a copy of the victims’ autopsy reports—to no avail. DeShon alleged that Mr. Cummings “swindled” his way into representing him. Circuit Judge James C. Hankinson had been conducting court events regarding DeShon outside of DeShon’s presence. The Motions Appointing Counsel that Circuit Judge James C. Hankinson had withheld from the Leon County Clerk of Courts named Samuel Olmstead as DeShon’s Regional Counsel dated February 14, 2011. On March 7, 2011 Samuel Olmstead filed a Motion to Withdraw from DeShon’s case and Appoint a Conflict-Free Attorney. On March 9, 2011 Circuit Judge James C. Hankinson signed a Motion Appointing DeShon a Conflict-Free Attorney named Baya Harrison. Again, Circuit Judge James C. Hankinson withheld this Motion from the Leon County Clerk of Courts—therefore, the Leon County Clerk of Courts could not give DeShon or DeShon’s mother the name of DeShon’s court appointed attorney. Although DeShon’s mother had agreed to hire Mr. Cummings on March 10, 2011, DeShon’s mother continued to call the Leon County Clerk of Courts and the Office of Criminal Conflict and Civil Regional Counsel’s Office seeking the name of DeShon’s court appointed attorney. DeShon never knew of Mr. Samuel Olmstead or Mr. Baya Harrison. In response to DeShon’s complaint filed with The Florida Bar, Mr. Cummings acknowledges not having disclosed to DeShon that Mr. Baya Harrison had been court appointed to represent him. (Again, Mr. Cummings knew that DeShon and his mother wanted to speak with DeShon’s court appointed attorney before deciding as to whether or not they would retain a private attorney—which DeShon and his mother concluded as to why Mr. Cummings failed to inform them about Mr. Baya Harrison.) Instead of The Florida Bar acknowledging DeShon’s valid complaint and recognizing Mr. Cummings violations—The Florida Bar never responded to Deshon’s rebuttal. While The Florida Bar has handed down punishment to Attorney Charles ‘Chuck’ Hobbs for failing his client’s best interest—why has The Florida Bar failed to appropriately hand down punishment to Attorney Gregory Cummings for failing his juvenile client’s best interest and throat cutting attorneys Samuel Olmstead and Baya Harrison by soliciting their client knowing that their client had no idea of their appointment to his case? As DeShon’s mother found the possible reason for Mr. Cummings and others to perform unethically in regards to DeShon’s case may have been due to the fact that Leon County Sheriff Larry Campbell, who had jurisdiction over the double murder case and his son State Prosecutor Jack Campbell who was prosecuting the double murder case had LIED about evidence leading to DeShon being charged with the murders. DeShon’s case was plagued with corruption. DeShon’s mother is not the first person to be concerned about State Prosecutor Jack Campbell and his dad Leon County Sheriff Larry Campbell having exclusive and shared interest in jailhouse inmates. Below is a copy of a partial Back Story of Attorney Charles ‘Chuck’ Hobbs. In this article Attorney Hobbs expresses his concern for his client in which State Prosecutor Jack Campbell is prosecuting the case—in which Mr. Hobbs’ client is being held in the Leon County Jail—which is being run by State Prosecutor Jack Campbell’s dad—Leon County Sheriff Larry Campbell. WCTVLIVE: Defense for Tallahassee Killer of Four Motions to Suppress Evidence 7-23 5pm … Segura’s attorney now wants him moved from the Leon County Jail. … Segura’sattorney also claims his client was pepper sprayed for requesting … Hobbs also pointed out that Segura is being held in a jail run by the prosecutor’s father. The 2nd Judicial Circuit consists of six counties. 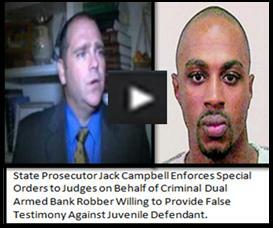 It is unclear as to why 2nd Judicial Circuit State Attorney Willie Meggs allows Assistant State Attorney Jack Campbell to prosecute criminal cases in which his dad—Leon County Sheriff Larry Campbell has jurisdiction over. The majority of witnesses in DeShon Thomas’ case were Leon County Sheriff’s staff members. Instead of bringing an AT&T representative to explain DeShon’s cell phone tower activity and text messages activity, Leon County Sheriff Criminal Analyst Leslie Rabon presented her data—her spreadsheets and her MapQuest data—in which did not place DeShon at the crime scene as Don Odham had stated in the Probable Cause Report. (SN: Circuit Judge James C. Hankinson was removed off of DeShon’s case—six months before DeShon went to trial. DeShon went to trial with Regional Counsel from the Office of Criminal Conflict and Civil Regional Counsel’s Office (Daren Shippy) and another Circuit Court Judge (Jackie Fulford). Despite DeShon’s mother’s numerous pleas to Governor Rick Scott to appoint a special prosecutor to DeShon’s case—State Prosecutor Jack Campbell maintained the prosecutor on the case. Several Leon County Sheriff’s Deputies were put in compromising positions—some of the deputies lied to the jury while other deputies sat idle on the witness stand and allowed State Prosecutor Jack Campbell to lie to the jury.) Subsequently, it was announced that the jury found DeShon guilty. DeShon had been in the Leon County Jail for nearly 3 years. Of those three years—DeShon had spent the last year in solitary confinement—where DeShon was unable to call home or have visitors. While it is believed that DeShon was placed in solitary confinement as punishment for firing Mr. Cummings—none of the court appointed attorneys assigned to DeShon’s case following Mr. Cummings attempted to ensure DeShon’s rights had not been violated. Despite knowing that State Prosecutor Jack Campbell launched a scheme to have DeShon charged with Solicitation to Commit 1st Degree Murder—which is why DeShon was in solitary confinement. Clearly, Mr. Cummings has the support of the 2nd Judicial Circuit for his failures to represent DeShon which violates the laws supported by the Florida Supreme Court. Author MAUL10Posted on May 14, 2014 May 14, 2014 2 Comments on Is The Florida Bar A Racist Organization? Do They Discriminate Against Their Black Members? Do They Discriminate Against Black Clients Who File Complaints Against White Lawyers? Is There A Certain “Classification” of Lawyers Who Are Immune From Disciplinary Actions Being Brought Against Them? Or Is The Florida Bar Just An Extension of Tallahassee’s ‘Good Ol’ Boy’ Network?